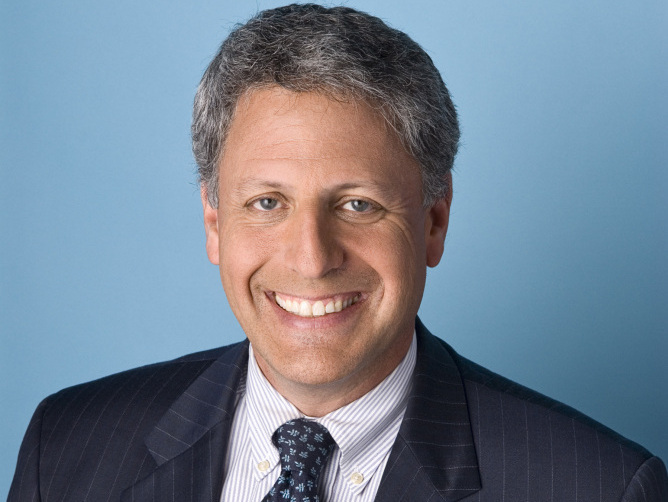 NPR Names Sesame Workshop's Gary Knell As CEO/President : The Two-Way He has led Sesame Workshop for a dozen years. NPR launched the search for a new CEO and president last March, after Vivian Schiller departed following controversies that led the board to conclude she couldn't effectively lead the organization. Incoming NPR CEO and President Gary Knell. Gary Knell, president and CEO of Sesame Workshop – producers of the Sesame Street educational children's TV show — has been named the new CEO and president of NPR. The news was broken this hour on Weekend All Things Considered. Knell will take the positions on Dec. 1. Dave Edwards, chairman of NPR's board of directors, this evening called Knell "an extraordinary leader with extensive experience in public media, programming and education." For his part, Knell said in a statement that he's thrilled to be joining "one of the world's most respected and leading providers of news, music and cultural programming." His selection culminates a search that began last March when Vivian Schiller resigned from those positions. Two high-profile controversies had led the board of directors to conclude that she could no longer effectively lead NPR. "Knell was Managing Director of Manager Media International, a print and multimedia publishing company based in Bangkok, Hong Kong and Singapore. In this capacity, he oversaw the development of the monthly business magazine Asia Inc., the daily Asian-based newspaper Asia Times, and several trade publications. "He also has served as Senior Vice President and General Counsel at WNET/Channel 13 in New York, was Counsel to the U.S. Senate Judiciary and Governmental Affairs Committees, and worked in the California State Legislature and Governor's Office." Last month, a profile by the Gannett news website LoHud.com said that Knell's "original career goal was to become a journalist. In between jobs as a lawyer for the U.S. Senate and a government affairs job at PBS' New York station, he spent a year in the Caribbean writing stories for American magazines and newspapers." He has been blogging about his work with Sesame Workshop here, and has been known to quip that he's "the only CEO in America who has to demonstrate the 'Potty Time Elmo' in front of his board of directors and get paid to do it" (video here). -- The dismissal last fall of NPR analyst Juan Williams after he said on Fox News Channel that he gets nervous when he sees people in "Muslim garb" on airplanes. Williams went on to say it's wrong to profile or stereotype anyone based on his or her appearance, but NPR said it was one of a series of comments he had made that violated the network's standards. The handling of his dismissal and the controversy surrounding it — including comments Vivian Schiller made about Williams that she later apologized for — made headlines for several weeks. That controversy also led to the resignation of NPR's top news executive at the time, Ellen Weiss. Her permanent replacement has yet to be named. The controversies fueled calls by some in Congress to cut funding to NPR. Since Schiller's departure, NPR general counsel Joyce Slocum has been acting CEO and president. She said publicly that she did not wish to be considered for the posts on a permanent basis. "Is a member of the Council on Foreign Relations and the U.S. National Commission for UNESCO, serves as a Director of executive search firm Heidrick and Struggles, is on the Board of Governors of the National Geographic Education Foundation and is a Board Member of AARP Services, Inc, the Jacob Burns Film Center and Save the Children. He is also an advisor to WFUV, public radio at Fordham University, the Annenberg School of Communications at USC, and Common Sense Media." NPR media correspondent David Folkenflik reports that Knell says he hopes to "calm the waters a bit" at NPR after the crises and political controversies of the past year. He also hopes to "depoliticize" partisan debate over the future of public radio. "It's not about liberal or conservative — it's about fairness," Knell told David this evening. "We've got to make the case we're delivering a fair service, not only in the way we do our jobs, but in the way we disseminate the news." David also reports that Knell, who now lives in the New York City area, plans to move to the Washington, D.C., area after his daughter graduates from high school next spring. "In 2009, the most recent year for which Sesame Workshop's tax returns are publicly available, Knell received pay of $684,144 and additional compensation of $62,000. He said he would be taking a pay cut to accept the job. He also currently serves on the board of the for-profit arm of AARP, but said he was leaving it by early next year. "Three decades ago, Knell served as a counsel for Democrats on several Senate committees and subcommittees. He also pointed to work he had done on child obesity and child health at the behest of Republicans including then-Sen. Sam Brownback of Kansas and then-Secretary of State Condoleezza Rice." Update at 5:26 p.m. ET. Statements from NPR and Knell. NPR just released statements from Dave Edwards, chairman of NPR's board of directors, and from Knell. Edwards says that "Gary is an extraordinary leader with extensive experience in public media, programming and education. As CEO of Sesame Workshop for more than a decade, he has led a large, complex organization through a tumultuous media environment, helping it grow by providing innovative, engaging content in new and creative ways." Knell says "I'm thrilled to join NPR. Over the past 40 years, it's grown from an inspired idea to one of the world's most respected and leading providers of news, music and cultural programming – both on the air and across ever-expanding digital platforms. This is media with a deeply held mission, compelling history and boundless future. Simply put: it's journalism at its best. What an opportunity to work with the incredibly talented staff here, and to partner with stations, as we continue to innovate, expand civil dialogue and set the standard for media."